The iconic Silverstone Classic featured a wide variety of grids including the Masters F1 championship, the Super Touring Car Trophy, Historic Sports cars and new to 2015 the JET Battle Of Britain Trophy featuring Pre-66 GT and Touring cars. Qualifying for the U2TC race was underway first on the Friday, and a downpour throughout meant that the Mini’s where able to fly round the track quicker than the more larger cars. The 5 quickest cars featured the 4 Swiftune powered Mini’s of Rob/Josh Beebee, Adrian Barwick/Bradley Ellis, Jonathan Lewis/Matt Kelly and Martin Hunt/Patrick Blakeney-Edwards alongside a Cortina. The 50 minute race saw dry conditions meaning that the Mini’s had to fight hard, and the pairing of Jonathan Lewis and Matt Kelly finished in a fantastic 1st in class and 11th overall, as well as Kelly claiming the lap record. Martin O’Connell was close behind in 2nd in the Snetterton Speed Shop prepared Swiftune powered Mini followed by another Swiftune Mini of Graham Churchill/Peter Baldwin in 3rd. The JET Battle Of Britain race featured over 50 Pre-66 GT and Touring cars on track including the Swiftune Mini’s of Steve Jones, Italian driver Andrea Stortoni, Tom Westley and Jonathan Lewis against cars such as Jaguar E-type, Lotus Elan, Aston Martin D4 GT and Lotus Cortinas. 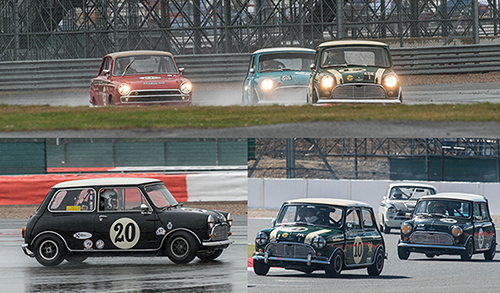 Another wet session meant the Mini’s of Jonathan Lewis and Andrea Stortoni qualified 2nd and 3rd overall. The trophy was split into two twenty minute races throughout the weekend and the first race on the saturday surprisingly didn’t feature rain. Final results were Jonathan Lewis first in class, followed by Andrea Stortoni in second also claiming fastest lap. Steve Jones finished 4th followed by another Swiftune Mini of Kevin O’Conner in 5th. The second 20 minute race on the Sunday saw Jonathan Lewis finish in a fantastic 3rd place in wet conditions, closely followed by Andrea Stortoni in 4th. Massive well done to all Swiftune customers that took part in the event, some great racing in the rain!